If you’ve been dragging your feet about finally signing up for the Air Force Marathon, you might want to make a decision fast. Not only is the time to sign up before a price increase goes into effect approaching, but marathon officials are predicting that the event might be sold out before it does. On April 2, the cost of the full and half marathons increase to $90 and $75, respectively. The 10K will go up to $45, while the 5K will remain at $25. The prices go up further on June 2, but that’s only if there are any spots remaining. Prices for the full and half are currently $85 and $70, while the 10K and 5K are $40 and $25. Marathon officials added an additional 1,500 runners this year, but expect the event to sell out even faster than it did in 2011, according to the press release. The Air Force Marathon will be held Sept. 15 at the National Museum of the United States Air Force, according to the press release. Participants start and finish at the National Air Force Museum, and spectators are welcome at the museum or in downtown Fairborn. Other events include a half marathon and 10K to be held on the 15th. The Air Force 5K hosted by Wright State University will be run on Sept. 14 at the Wright State University Nutter Center. The Sports and Fitness Expo will also be held at the Nutter Center on Sept. 13-14. All registered runners receive a T-shirt, hat, patch and goodie bag. 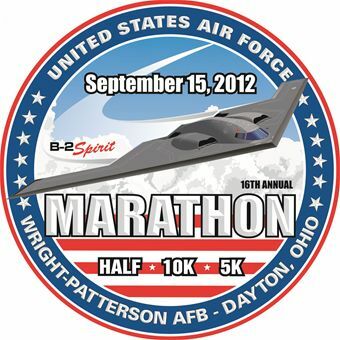 Everyone who finishes a race also gets a medal that this year features the B-2 Spirit bomber. Medals are presented at the finish line by a senior Air Force officer, according to the press release. The Air Force Marathon is a Boston Marathon qualifying event and the course goes past a number of historic landmarks including Huffman Prairie where the Wright Brothers perfected manned flight. For more information see http://www.usafmarathon.com.